Leading Exporter of road marking paint from Mumbai. We have over two decades of vast industrial knowledge and experience in producing superior quality Thermoplastic Paint Road Marking Service. one coat primer yellow / white in colour in driveway and parking marking. 3.5 mtr length straight and tirning arrow. 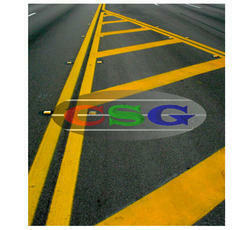 The basic materials used in manufacturing Road Marking Paint are well tested by our testing team to ensure its safety. Our engineers and technical team also provide customised designs Parking Marker Paint as per customer requirements and applications. Advanced techniques are used to produce Hot Melt Marking Paint with precision. Looking for Thermoplastic Road Marking Tape ?